Devise an approach to boost returns: Successful sales & pricing initiatives run according to plan from day one. This requires first identifying and prioritizing the main action areas. Next, you need to analyze your status quo and then compare it with industry benchmarks. 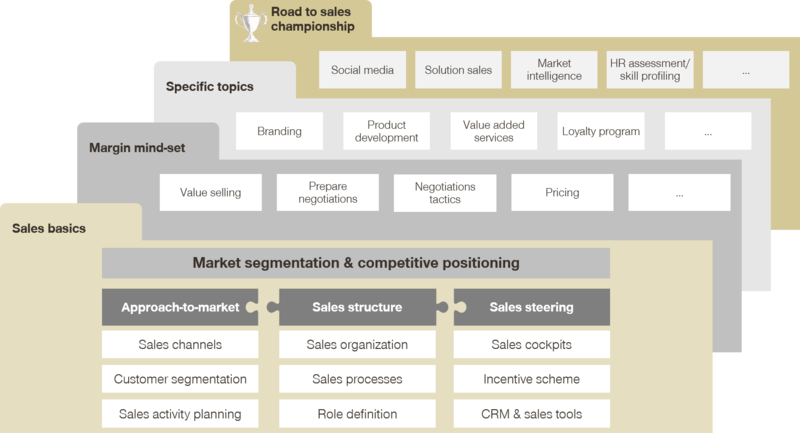 Based on the results, you can create a customized roadmap – a Sales and Pricing Playbook – with the most important improvement areas. Take things one step at a time. 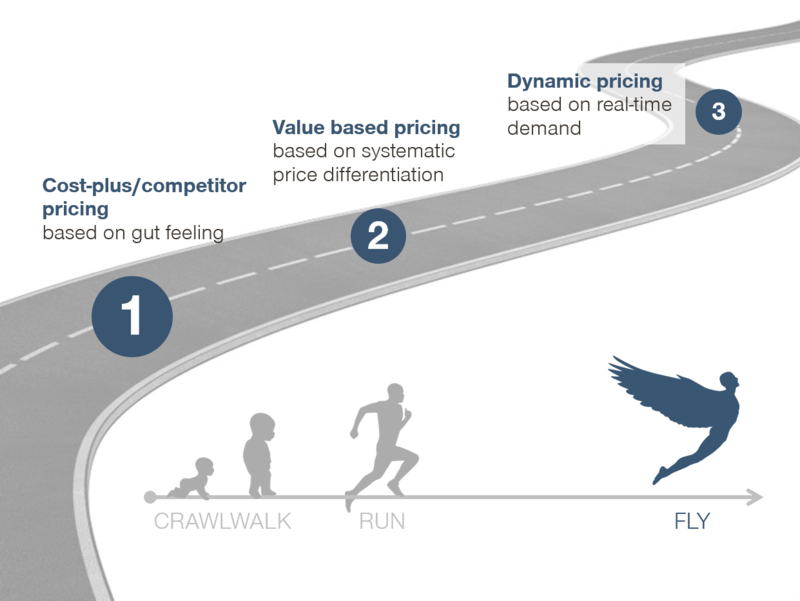 If you are still setting prices based on intuition or on a cost-plus approach, then you should not jump into dynamic pricing. Many people simply underestimate the implications of this kind of model. A dynamic model involves extensive data analysis skills and a deep understanding of customer behavior. Still, if you manage to lay the groundwork, there is no reason why you should not utilize innovative price models that will help you differentiate from the competition. It is the responsibility of C-levels to actively steer sales & pricing initiatives. In past decades, managers focused strongly on the cost side. Processes were optimized, purchasing professionalized and the efficiency in production was boosted. Since then, many company leaders have recognized that the cost side offers little opportunity to improve revenue further. The price as the number one profit lever plays an increasingly important role here. With the right guidelines and simple measures, managers can instigate significant changes in the short term. For initiatives to succeed, it is crucial that everyone involved is clear about what their responsibilities are. Too often there are two responsible for the same task or no responsible at all. E.g. if no one feels responsible for pricing, then the sales force will take care of it themselves. In doing so, the achievement of price targets cannot be measured. By creating a pricing manager function, pricing is given a clear organizational set-up. Reward margin-boosting behavior: A major hurdle of every sales & pricing initiative involves changing the mind-set and behavior of employees. To accomplish this change, it is important to get employees involved early on and to reward positive behavior accordingly. Well-established incentive systems provide a means of changing how employees think about the importance of profit vs. revenue. If a salesperson sees during a negotiation, for example, that a price cut would negatively affect his or her bonus, this increases profit awareness. Get things established before taking the plunge. A sure-fire way towards a failed pricing initiative is to force your team to cope with a highly complex price model. A price model needs to be transparent and easy to understand for everyone. This doesn't mean falling back onto naive methods such as cost-plus. Intelligent price models, based on strategic company goals, are a good alternative and easier to follow. And repeat again and again. Do not ever stop preaching until everyone understands that the new sales approach is about boosting profits, and not revenue. Success stories are helpful here. These positive examples should be talked about in regular training seminars. That way, you avoid falling back into old routines and everyone can learn from the best.